In a classic diamond frame, the frame exists of two triangles: one formed by the top tube, seat tube and down tube and another one by the seat tube, seat stays and chain stays. Those two trangles make the frame very stiff. The tubes and stays are loaded in tension or compression, but there is hardly any bending. 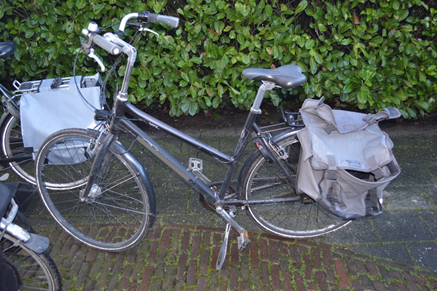 The bicycle in the picture below is a typical Dutch ladies bicycle. It is a modification of the classic diamond frame; the top tube is lowered to allow women wearing a skirt or dress to mount and ride the bicycle in a convenient way. Due to lowering the top tube, this tube is not connected to the seat tube at the same location (just below the saddle) as the seat stays anymore. As a consequence, the top tube will introduce a bending moment in the seat tube and with that: increased stress levels. Further, the torsional stiffness of the frame is reduced considerably. 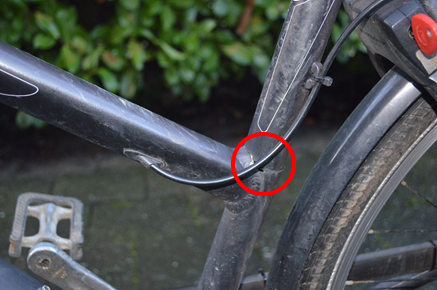 The picture below the fatigue crack at the weld between seat tube and top tube. This is a fatigue crack that could have been easily avoided with proper design.